Just a Quick Update is All. Hello again and sorry for the lack of new info regarding the building of Hobbit Hollow. Boy, it’s been rough on a lot of fronts lately. I really just wanted to get in a quick update is all this weekend. My youngest sister Terry got married over the weekend so work on the Hobbit house went into standby mode. It was a really nice wedding ceremony at the Mamaroneck Beach and Yacht Club. What a nice place. The weather didn’t cooperate though. Rainy, damp or drizzily from Thursday through Saturday. We didn’t let the weather dampen our spirits though. The wedding was a big success and Terry and her new husband, Alan, and all of their guests had a great time. Good luck to both of them! Ethan, and Jude came home from college to attend the wedding so it was a nice little homecoming for us, as well. The Long Islander made a guest appearance, too. So it was a lot of fun having everyone there at the wedding. What a blast! Hobbits really do know how to have a good time. Here’s a couple of pictures. Wedding prep: Terence,Ethan, Jude, and Georgia. 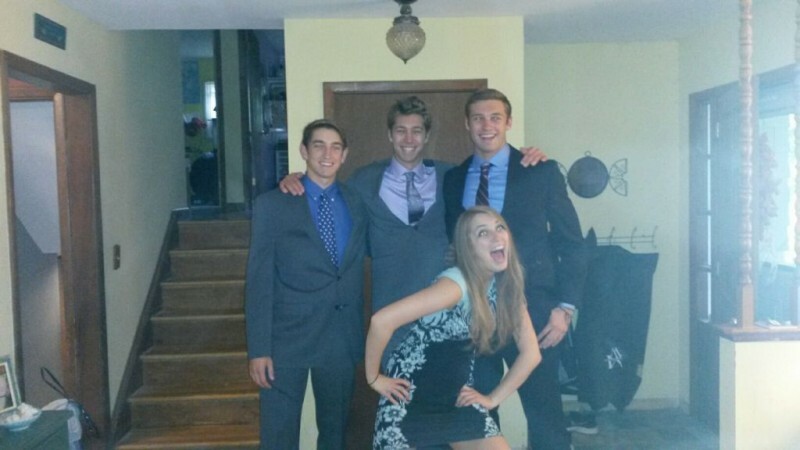 This is the most formal shot we could get out of these 4 knuckleheads. If it isn’t one person making a face it’s another. 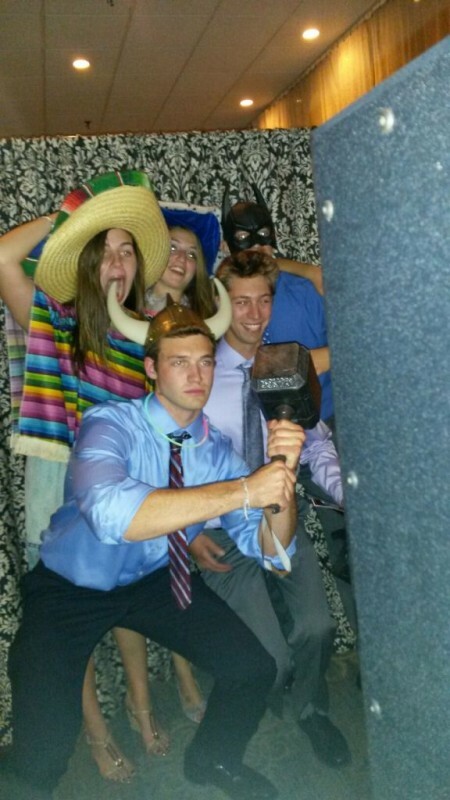 Wedding Photo booth: Gotta love the props! So it was a Friday night wedding with full fledge recovery Saturday. Terence had a football game Saturday night in Eldred, New York. So the Editor and I went to see him play. 7:00 pm start time, 92 mile drive. Got home at around 11:30. Oh well. The good news is they won. It was a massacre though. I never like seeing a massacre. I think the final score was 55-6. You had to feel bad for these poor kids on the other team. Nothing went right for them. So Sunday was pool closing day. I’ve been closing this pool for 20 years and it’s never, ever gone according to plan. This year was no exception. To make a long story short I finally relented and got a real pool cover. You know something you can be proud of. 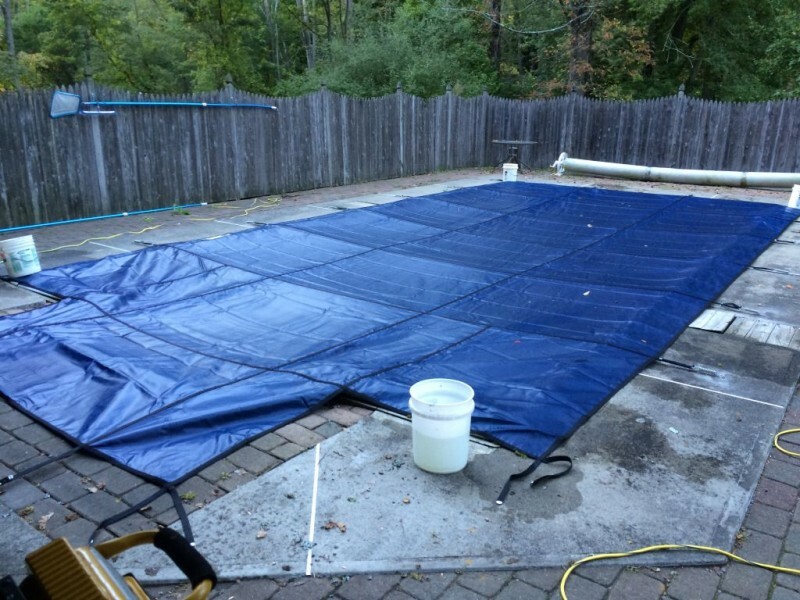 I’ve been going with a large tarp all these years and it closes up fast but the opening of the pool is brutal for a number of reasons which I will not share with you here. Let’s just say Jim’s area of expertise is not of the pool closing nature. Anyway the cover took a lot longer to install than I thought it would. But it looks pretty good. Check it out. I took this picture before it was all finished if you were wondering. Anyway, I’m glad you are still hanging with me and I hope to see you back next week! I really gotta try and close up this house before winter! The Pope the Tile and a Figure Eight! Debris controls the Job!….and Fun Filled Family Grouting!